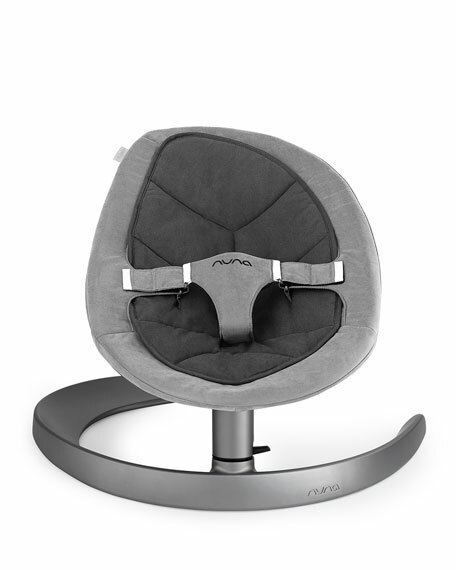 Nuna innovative LEAF Curv bouncer sways your baby gently back and forth. Noise-free, motor-free design-motion lasts unassisted with a gentle push for over two minutes. Made with plush, cushy Oeko-Tex® certified fabric. Organic cotton insert is soft and lightweight. Easily locks stationary for feeding and playtime. Evolves with baby to big-kid sizeup to 130 lbs. Perfect angle for both playing and napping. Recommended use: newborn to 130 lbs. Dimensions: 17.7"H x 28"W x 28.6"D; weighs approx. 12.5 lbs. For in-store inquiries, use sku #1781319.